Lounge and enjoy your time at home when you add this mid-size sofa to your living space. 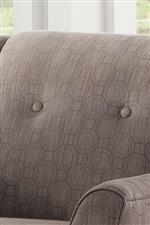 Three foam filled cushions offer comfortable and supportive seating to help you relax at home. 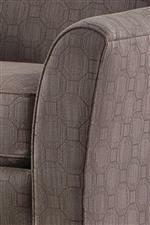 Casual design features include button tufting, flared arms, and tapered wood legs. The 236 Casual Mid-Size Sofa with Flared Arms by Smith Brothers at Saugerties Furniture Mart in the Poughkeepsie, Kingston, and Albany, New York area. Product availability may vary. Contact us for the most current availability on this product. Add a soft and casual look to your living room with this station living room collection. Button tufting on the seat back of each piece, as well as the flared arms, offer a simple design that is perfect for casual spaces. High density foam cushions give you plenty of comfort to come home to. Tapered legs lift the hardwood frames of this collection off the floor. With a variety of fabric covers available, you will be able to choose the right look for your home. The 236 collection is a great option if you are looking for furniture in the Poughkeepsie, Kingston, and Albany, New York area. Browse other items in the 236 collection from Saugerties Furniture Mart in the Poughkeepsie, Kingston, and Albany, New York area.